UPDATE January 12, 2019: It appears the Girl Gourmet Sweets Candy Bead Studio is not available anymore. I did find this Candy Jewelry Kit on Amazon which might be a good alternative, although I’ve not tried it myself. I think I led a somewhat deprived childhood. 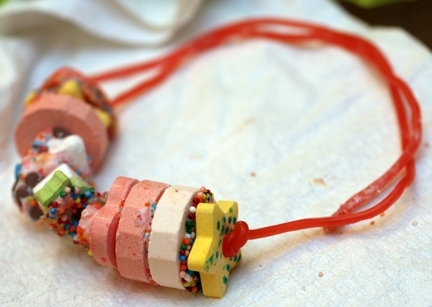 In all of my memories, I can only recall ever having ONE edible candy necklace. Chalk it up to parents who didn’t want to let me eat too much candy (to which my healthy mouth thanks them for.) So I couldn’t help but feel a little bit of childish glee when I had the opportunity to test out the Girl Gourmet Sweets Candy Bead Studio. 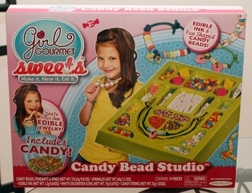 The Sweets Candy Bead Studio includes everything a girl would need to create her own edible, sugar-iffic jewelry. It has 24 edible string candy that you can “adjust” aka eat to size to make necklaces or bracelets, or even rings. Also included in the kit are candy stamps, frosting glue, edible-ink markers, and various kinds of candy beads and sprinkles. The Studio comes with a neat plastic tray to help you keep all of the pieces organized neatly. 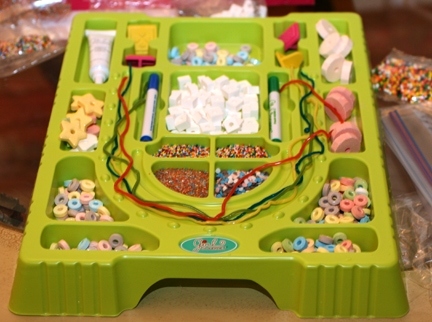 The tray also has a useful bead guide (the little bumps around the candy ropes) to help keep even beading spacing. Setting up the Sweets Candy Bead Studio is very easy. All of the beads, sprinkles and ropes are individually packed and sealed in their own plastic bags. Simply open the packages and organize the candy pieces into the appropriate bin on the tray. To make sure we didn’t use all of our candy at once, I kept a few pieces of candy behind, but the girls didn’t seem to notice and we still had plenty of jewelry making options to choose from. 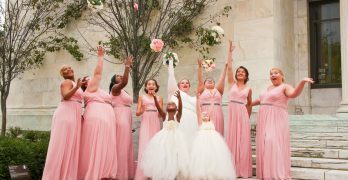 Once I had all of the candy neatly placed in its bin, the girls and I went straight to work, each grabbing different color string ropes and then playing around with the different jewelry making tools provided. I really liked the candy stamps – by coloring the stamps with the edible markers, you’re able to add your own patterns to the different candy beads. I used the stamps to make hearts on the white candy blocks. Ray used the stamps to create little dots on some of the larger candy beads. All three of use made generous use of the glue frosting and sprinkles. Simply spread the frosting on one of the beads and then dip it into one of the sprinkle trays. I really liked having the edible-ink markers so you could really customize the candy jewelry to each person. Designed with lettered blocks, stamps, knots, and rainbow sprinkles. She used the white blocks, lots of rainbow sprinkles and regular candy beads. Ray did a little bit of everything but used LOTS of glue frosting and sprinkles. You can also see where she used the stamp to decorate the star. The actual candy from the Sweets Candy Bead Studio is really good. I found myself munching on the white candy blocks and the blue beads WAAAY more than I should have. The different candies have different flavors – I was able to taste watermelon, lemon, and the “white” flavor (I have no idea what the actual white flavor is, but all white candies have the same taste.) WARNING: Keep the string ropes away from boys (both young and old.) 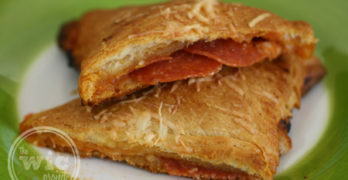 They will try to eat them. The girls and I had so much fun making (and eating) the candy jewelry. Star was excited that she had discovered a way to sneak food into the library in the form of her new candy necklace. Haha! The Girl Gourmet Sweets Candy Beat Studio and the candy refills are available in stores and online with a suggested retail price of $19.99. 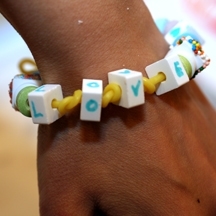 Designed for ages 8+, it can be a fun project for girls young and young at heart.